Sautee Cabbage, Mushrooms, and Onions. Add in rest. Adding in water to keep from burning. Add Mushroom Mix to Egg Rolls and Sprinkle with Parmesan. Roll. Butter Spray Egg Rolls. Cook (I used Air Fryer). Sprinkle with Garlic Powder or Garlic Salt. I got a large 9 pound Pork Loin ON SALE! So, that’s what I used for this meal. I cut up to make 3 freezer friendly meals. This is one of them… AMAZINGLY TASTY! PREMIX everything, except Pork. Add Pork to Freezer Friendly Ziploc Bag. Pour over mixture. Rub around as best as you can. Remove air and seal. Freeze. Cooking: Butter Crock Pot. Add everything. Add 1/4c Water to Crock Pot (I add 1/4c Water to freezer bag, shake around to get all those left behind seasons. Then, pour into Crock Pot.). Once meat is cooked, cut up. Cook additional hour, or so. Serving: Add Pork to Burrito Shell. Add Cheese, TACO SAUCE, Lettuce, Tomatoes, Onions. Wrap up, folding in sides. Butter Cooking Spray a skillet. Brown each side of Burrito. Sprinkle with Garlic Powder. Serve with Sour Cream and Salsa. *Note: ONE Beef Broth Cube, crushed, can be used if you do not have this. Toppings Ideas: Tay’s Guaca-HOLY MOLY Sauce, Shredd. Cheese, Sour Cream, Salsa/Pico de Gallo, Tomatoes, Queso Cheese or Sauce, THIN spread of Mole, Shredd. Lettuce. Optional (Soft Shells): Heat Skillet. Spray with Butter Flavor Cooking Spray. Top shells with Above. Roll. Add to heated and sprayed skillet. Brown each side. Sprinkle with Garlic Powder. Also, Optional to add or top with Bell Peppers. Not an Avocado Person? NO WORRIES! Just skip it! Add FROZEN Chicken to a pot with Water and 1-2 crushed Chicken Broth Cube(s). Turn on heat. Bring to Boil til cooked. Allow to set a few minutes in Broth. Cut up. Mince Vegis. Toss Chicken, Bacon Pieces, and Vegis. Blend Sauce ingredients. Mix, TO DESIRED CONSISTENCY, with Chicken (I did all). Add to Egg Rolls. Optional to Top with Shredded Cheese. Brown in Butter Flavor Cooking Spray Skillet. OR, Bake in Oven (Sprayed with Butter Spray on both sides). OR, Fry in Oil (Try Coconut Oil). Serve with Salsa and Sour Cream. Notes: Up, Downsize, or Skip Vegis, to your taste! FREEZER FRIENDLY. Once browned (I use Butter Flavor Cooking Spray), add to plate. Freeze. ONCE FROZEN, add to Freezer Ziploc Bag! ReHeat in Oven or Microwave-Cooks fast! Add all to Crock Pot. Cook on low 8, or so, hours. Add to Shells/Bun of choice. Top with Taco Toppings of Choice. We used Tay’s Jalapeno White Sauce along with tTt’s Pico de Gallo, Shredd. Cheese, and Lettuce. ***LEFTOVERS***: Use for Tay’s Bread Bowl Tacos! YES TRY THESE!!! A NEW FAVORITE! A MUST TRY!!! Not a Shrimp Person? Options Below! Make Sauce: Remove skin and seed, MASH Avocado! Then, I add Sauce Recipe to Blender, blend. Set aside. In SEPARATE PANS, Heat 1tsp Oil in each, cook Shrimp and Chicken. Spring Rolls: Soak each Sheet in Water for about 30 seconds. Top with ingredients. Roll. Tacos/Buns– Top. Add Cheese, Salsa, Sour Cream, if desired. Eat. Note: OPTIONAL to also add grated Cucumber to Carrots, Onions, Celery. In skillet, cook Meat, adding in all TOP Ingredients (First 9 ingredients). COOK DOWN JUICES. Top with Shredded Cheese, Queso, and Parmesan. Cover with lid. Cook on LOW/Simmer til all’s melted. Serve with Balsamic Garlic Spread/Dressing (Recipe below). Premix, allow to sit about 15minutes. Top over Burgers, Sandwiches, Wraps, Hoagies, etc. NOTES: Chili Style Ground Beef is NOT Seasoned… It’s the type of Ground-ness. Also, Turkey, Chicken, Steak can be used… To Cut Calories. MAKE INTO A SALAD! Just add to Lettuce to Cooled Meat Mix, add in Cheese (Fresh Queso), Parmesan. Top with Dressing. Add Queso Cheese. Serve each with Dressing and Croutons! Preheat oven to about 400. Mix Sauce. Toss Shrimp in Egg+Coconut Milk Mix. Dump into Cornstarch Coating. Toss. Add into skillet with heated Coconut Oil. Fry on both sides. Add to baking pan. Top with Sauce. Bake, uncovered, about 18minutes, cooked to desire. Rice: 1 Broth Cube per 1c Rice, crushed. Add Water, Rice, Vegis together. Cook. Serve Shrimp over Rice. Notes: My original recipe was going to try Coconut Milk with SWEETENED Condensed Milk… But, realized I didn’t have any. So improvised with this Recipe. 1/3c Coconut Milk + 1/4c Condensed Sweetened Milk then 1/2tsp Brown Sugar, rest of ingredients the same. I liked it the above way, tho. Marinade Fish/Chicken (Chicken marinades 4+ hours). Discard excess Marinade. Cook in skillet in Extra Virgin Olive Oil. Avocado Sauce: Blend all til smooth. Slaw: Mix below ingredients, add in Coleslaw and Onions. Top shells with each. Lil fish goes long way! If using Soft Shells (As I did)- Roll. Heat Skillet. Spray with Butter Flavor Cooking Spray. Brown each side of Taco. Sprinkle with Garlic Powder. Slightly soften Cream Cheese. Mix Cream Cheese, Mustard, Worcest., Horseradish, then add in Scallions and Pepper. Spread thin layer onto entire Soft Shell. Line with a few sliced of Corned Beef. Top lined Beef with Sauerkraut, then Tomatoes (Optional), then Shredded Cheese. I also add a LITTLE sprinkle of Cheese around entire Shell. OPTIONAL (I skip): Add a THIN line, down the Beef, with EITHER Russian OR Thousand Island Dressing. Only a THIN line. UP TO 1 tsp WISHBONE Ranch Dressing PKT. Soften Cream Cheese. Mix in Wasabi. Mix in Ranch Seasoning and Scallions. Use on Bagel Sandwiches. On Pinwheels with Smoked Ham or Turkey, Shredd. Cheese, and Tomatoes. On Chicken Sandwiches. Wraps. With Crab/Fish. Etc. MANY USES!!! Having a little leftover Orange-TAYstic Chicken, I thought of a GREAT Pinwheel Recipe! Mix Cream Cheese and Wasabi. Stir in Scallions. Spread onto ENTIRE Shell. Add a line of Orange Chicken, then top that line with Rice and Vegis. Roll snug. Wrap in Foil. Fridge for 1 hr. Eat, or, SLIGHTLY Warm and Eat. *Orange-TAYstic Chicken is an Orange Chicken with Sweet Bell Peppers and Onions, topped over Chicken Broth Rice with Peas and Carrots. Saute Onions, add in rest of Bean Mixture Ingredients. Top onto shells with Adobo Chicken (Shredded) and Toppings. little Garlic Powder onto browned soft shells. In ziploc bag, add all. Marinade about 5-6 hours. BEST ON CHARCOAL GRILL!!! Grilling Tip: We build a hill in center of grill. Light charcoal (We used Hickory Charcoal). Once coals are ashy grey, they are ready. Place on food, on outside of hill of charcoal. Prop Grill Open, using a Slightly crushed pop can. Chicken: Lay Chicken on outer part of grill (Outside hill). Once Chicken isn’t sticking to grate, so much, it’s ready to flip. Flip once, that’s it. Cook til Thermometer reads correct temp. Toppings (All Optional): Shredded Cheese, Sunny Side Up Egg (Or Cheesy Scrambled), Queso, Mexicana Crema or Sour Cream. Cut Red Potatoes. Add to ziploc bag, season, and mix. Bake til done. Cook Meats with Seasons and minced Garlic (Remove Bay Leaf prior to rolling). Top with Toppings of Choice. Roll. Butter Flavor Cooking Spray Skillet. Brown each side. Sprinkle LIGHTLY with Garlic Powder (Or Garlic Salt- I use Powder). Note: You can use Other Potato Options, too. Seasoned Southwestern diced Potatoes, Hashbrowns, Tater Tots, etc. Above is best! We’ve made Adobo Pork Loin over Coconut Rice (With other options on Post). But, this is using same idea, but, with Grilled Vegis and Cilantro Rice. Great Combo of Flavors! MARINADE is also great for Legs/Bone-In Breasts/Thighs, too! Eat Adobo Chicken Alone. With Vegi Mix, or with Vegi Mix+Rice, or on Tacos (With Refried Bean Mix, below, is AMAZING!). Place Chicken in Ziploc Bag or Bowl. Marinade 6 hours. BEST ON CHARCOAL GRILL!!! I microwave Rice with Pinch of Sea Salt. Once done, add a Little Splash of Lime and then a few Shakes of Cilantro. Toss. Cover. Eat Chicken on top of Vegis with few Spoons of Rice. Boil Chicken (Don’t bother bring to boil before adding Chicken… JUST ADD ALL IN!). Cut Up. Sautee 1st 8 Ingredients in Sesame Oil. Top Egg Roll Wrappers with Chicken Mix, Sauce, then, sprinkle of Cucumbers. Roll. Heat skillet, Butter Flavor Cooking Spray it. Brown all sides of Egg Rolls. Eat. Optional to mix Chicken and Sauce to desired consistency. In pan, cook above 10 ingredients (I add Fajita/Taco season near end), til about, or to, soft. Cook Rice (I did in microwave with 1c Instant Rice + 1c Water + 1c worth Vegetable Broth CUBE). Top Soft Shell with about 1/3c Vegi Mix, 1-2T Cooked Rice, 1 small smear of Sour Cream, SMALL Sprinkle of Cheese, about 1T of Salsa. Roll. Add to Butter Flavor Cooking sprayed baking dish. 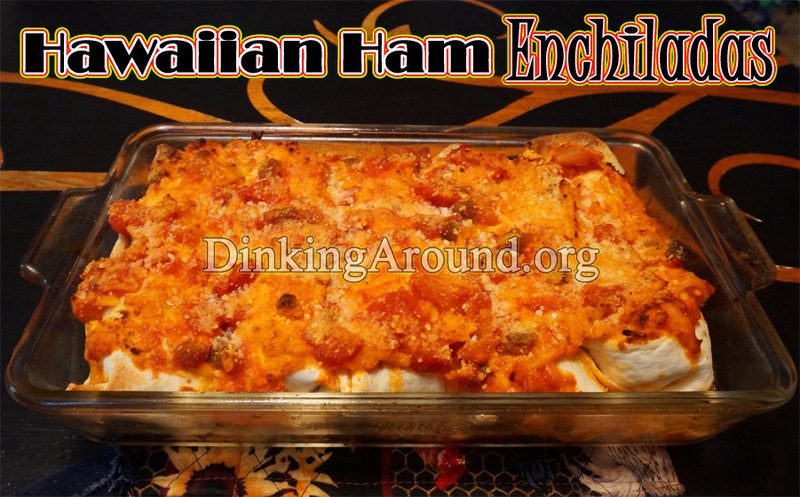 Top with Cheese and Enchilada Sauce. Bake, uncovered, at 400 for about 30-35 minutes. Serve with Sour Cream. Boil Sweet Potato in Broth (I used Chicken Broth) WITH 2 Bay Leaves- RESERVE 3T of Broth, when Potato is done boiling. Mash Potato with 3T reserved Broth (I leave skin on- DELICIOUS! And, Beneficial). In skillet, heat cans of drained Beans with Poblano, Smoke, and Seasons. Top Egg Roll with a THIN spread of mashed Sweet Potato, Beans, Salsa, Sour Cream (Or Pico de Gallo/Crema Mix), then Moz. Cheese. Roll. Heat skillet. Spray with Butter Flavor Cooking Spray. Brown all sides. – Instead of smooth Sweet Potato. You have an option to saute 1/2 Sweet Potato (CUBED SMALL) with 2 Bay Leaves. Then, top onto rolls. I liked the Smooth Potatoes!!! – Meat Optional: Chicken, Smoked Turkey, Chorizo (A little goes long way. No more than 1/2 lb.). – Baking or Deep Frying is optional. Mix all meat ingredients, WELL, adding Rice in last. Allow to set about 15 minutes, before rolling. Prep Cabbage Leaves for Rolling: I cut off stem. Bring Water to boil. Add in head of cabbage. After about a minute or 2, the leaves are bendable enough to roll. Carefully, peel each leaf off. Form handful logs of Meat Mixture. Roll in Cabbage Leaves (I start opposite side of stem, easier.). Lay into Butter Flavored Cooking Sprayed Baking Dish. Top with Sauce. Cover with Foil. Bake in preheated oven, at 425, for about 45 minutes. I allow to sit a minute, before serving. Optional: Add a few Tablespoons of Sauce Mix to the Meat Mix. I didn’t. *Notes: Lean Beef may work. Half Pork Half Beef, may work. I have yet to try either, to cut calories. Above was tasty, as is, but your option. Marinade Chicken AND whole Cherry Tomatoes (*See Notes) for about 7-8 hours (I did 7). Cube Chicken (I do a quick toss back in marinade.). Add chicken to Butter Flavor Cooking sprayed Baking Dish. Add in Peppers, Onions, Garlic, and Ham. Cover with Foil. Bake at 450 for about 20 minutes. Then, mix around. Uncover. Bake additional 25 minutes. Top onto Bun/Wrap of choice. Top with sauce. Notes: Top with Minced Jalapeno for heat. Or Red Pepper Flakes in marinade, for heat. You can skip Cherry Tomatoes and use slices for Topping. Ham is optional- You can choose to use Cooked Bacon as Topping, instead. Cheese and Lettuce/Spinach are optional toppings, as well. *** Even Using Sauce Recipe as a Base for HAWAIIAN PASTA SALAD. Make Sauce. Add in COOKED Chicken, Ham, Peppers, Onion, and Garlic (May need to alter amount of chicken). Add cooked Bowtie Noodles. *** Coming Shortly: Chicken Leg/Wing/Breast Marinade stemming from this. I bake Bacon- Line pan with foil. Bake (No need to preheat) at 425 for about 12-15minutes. Fill Stove Top Pan with enough water to cover all, but, 1 inch of chicken (Top inch is out of water). Add in 1 Chicken Broth Cube. Boil til cooked (Optional: I sometimes boil til water runs out and allow to sizzle a minute. TASTY.). Cut up chicken. EVENLY, sprinkle with season. Toss with ranch dressing. Mix well. Top onto wrap of choice. With Toppings of choice. NOTES: Low Carb? Try Lettuce Leaves for Wraps. Egg Roll Wraps, work. Even Lower Calories- Try Turkey Bacon! Or, sprinkle a little Ranch Pkt. over WITH McCormick’s … Endless Options. Heat skillet with Sesame Oil. Add in Mushroom, Onions, BAY LEAF, and Garlic. Add in Chicken, Beans Sprouts, Mustard, Garlic Powder, Red Pepper Flakes. Cook til Chicken is about done. Mix Sauce in bowl. Add to Chicken. Cook down sauce. Add to lettuce leaf wraps with: Grated Carrot and Coleslaw (Coleslaw Optional). Also, a line of Srirachi Sauce on each (Optional). Notes: You can add in drained and halved Water Chestnuts, desired amount. You can add Hot Chili Oil into Sauce Mix (About 1/2tsp) to kick it up. You can wrap this in an Egg Roll Wrapper and Butter Flavor Cooking Spray a skillet. Brown each side. Or, frying is optional. Even if you wanted to incorporate Hot Chili Oil: Brush Rolled Egg Rolls LIGHTLY with Chili Oil. Bake them! Endless Options! Above is only way I’ve tried. Eat this on Pita Bread (Yes! ), Bagels, Wraps of choice, Alone, or Over Rice, as a Pizza! … Endless Ideas. Cut chicken how you like (Cubes, 1/3s (Like Tenderloins), etc.). Marinade 6-8 hours. Cook chicken in skillet. Spread Pita with thin layer of Hummus (Photo is of Soft Shell- We forgot Pitas at store.). Top with some Chicken. Top with a spoon of Cucumber Salad/Slaw. Eat! – If Rice: Use Instant Rice. In bowl, add rice amount of choice, water suggest for amount of rice, and chicken broth cubes (I use 1 cube per 2 cups uncooked rice). I microwave according to time suggested in instructions. – If Pita Pizza (Soft flour shell can be used for crust, as well- Less Carbs Less Calories): Preheat oven to 450. Spread Hummus onto crust of choice. Top with Chicken. Shredded Moz. Cheese is optional. Bake about 8minutes. Cut. Top each slice with lil Coleslaw Mix. LIGHTLY/BARELY Butter Crock Pot. Add in all, EXCEPT, bottom 3 ingredients. Cook on low 8 hours. LAST 1-2 hours, top with layer of Pastrami. Layer of Pepperoni. Then, top with cheese. Cook remaining time. Serve on toasted buns, loaves, hoagies, wraps, lettuce leaves, etc… Of Choice. NOTES: Wishbone Italian Season Packet is optional. We loved it, so sticking with it. Another packet (Onion, Au Jus, etc.) can be used in it’s place (If so, I’d add 1/4c water- I have yet to try, so use your own judgement). It’s also optional to skip packet, all together… Also, have yet to try. Pastrami can be cut into strips or chunks. If you put on with whole slices, put UNDER Pepperoni. Otherwise, you will scoop out all the top with it… FYI. Do what you will with this Orange Sauce Recipe. Use Marinade, then Cook/Grill, toss Sauce with Cooked/Grilled Chicken Legs/Wings/Breasts. Bake with it. Top over Stir Fry Vegis. Many Endless Options. Here’s one of the MANY ways we use this sauce! Marinade chicken for 1 hour. Best time to make orange sauce (Be sure to Mince up chipotles WITH sauce), place aside. Cube Chicken. Brown chicken in skillet (No need to cook through). Butter Flavor Cooking Spray a baking dish. Add chicken. Toss with sauce. Top with mandarin oranges. Bake in preheated oven at 450 for about 15minutes, uncovered. Toss, bake additional 10-15 minutes, or til done. Allow to cool a minute. Give light mix. While chicken is baking, mix coleslaw mix. Cover and fridge til done. Top lettuce wrap OR over Rice (Cooked in chicken broth, then few shakes of pepper. ), top with a little coleslaw mix, then toppings. Enjoy. Notes: Coleslaw mix is optional if using rice option (USE IF DOING WRAPS!!! It’s tasty!). Option to use Lemon Cilantro Rice cooked in Broth. Optional- Minced celery can be added to coleslaw mix or to chicken while cooking. Skipping coleslaw mix and just topping over rice. Endless options, options, options. OPTIONAL to Marinade Chicken Breasts. GRILL. Toss with Sauce!!! Butter Flavor Cooking Spray baking dish (Mine fit 6 tacos). Blend together Cream Cheese Mix. In separate bowl, toss together Ham Mix. On soft shell spread THIN layer of Cream Cheese Mix. Top with Ham Mix. Top with: Tomatoes, Spinach, and MOZ. Cheese. Roll, tucking in corners. Lay into baking dish. Mix topping together (Salsa/Chedd. Cheese). Top over rolled shells. Sprinkle with good amount of Parmesan Cheese. Bake, uncovered, at 425 for about 40minutes, or so. Note: My ham was not precooked. I’m sure there’s no big difference in that. Optional to add a few Tablespoons of Pineapple Chunks, chopped smaller. I forgot. But, thought it had the perfect amount of sweet, so will continue to skip it! Also, can kick this up with adding a lil bit of Red Pepper Flakes or minced Jalapeno! Not only is this lower in calories, than most salad recipes, this is beneficial! Using Greek Yogurt! 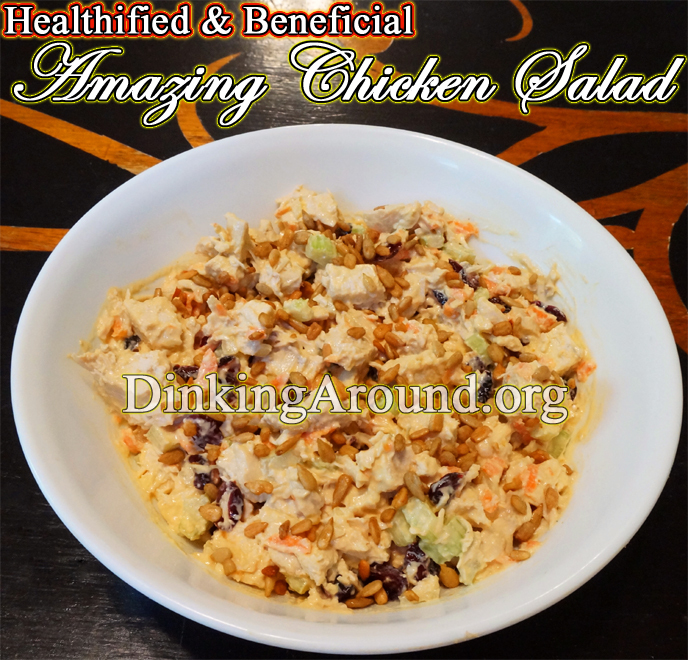 AMAZING tasting Salad, that just happens to be Healthier! Wrap/Bread of choice: Lettuce Leaf, Bun, Bagel, Taco Shell, etc. I boil chicken in water with few Chicken Broth Cubes, I don’t do exact ratio of water to cube, I just throw a few CRUSHED cubes in. Once cooked, I allow to set a few minutes in broth. Remove chicken and cut up. Toss with rest, EXCEPT, sunflower seeds. Top with desired amount of sunflower seeds. Notes: I always premake about 20minutes prior to serving time. Place in fridge. If sits too long, chicken will absorb flavor! I believe I did 1tsp of Parm. Cheese… Not sure. Start with 1tsp… Taste test. Make this into a pasta with cooked bow tie noodles. Upping Mayo, etc. Optional… To your taste! Choice to Miracle Whip up the bread, is optional… As well. In Butter Flavored Cooking Sprayed pan, lay chicken. Top with Chili Sauce, Green Chiles, and Celery. Bake, covered, 425 for 45min. Allow to set few minutes when done. Lay onto wrap of choice (We used Lettuce). Top with Fresh Sliced Onions and Grated Carrot. Optional (WE DID! ): Top with a little Coleslaw that was tossed with a little Kraft Creamy Poppy Seed Dressing (A little goes a long way!). In Butter Flavored Cooking Sprayed pan, lay chicken. Top with rest of ingredients. Bake 425, covered, for about 45minutes. Allow to set few minutes when done. Serve over Rice cooked in Chicken Broth and sprinkle of Pepper. *NOTES: You can very well try boiling chicken (Maybe with Broth Cubes…?). Once cooked, remove chicken. Then, mix in rest. Cuts time in half.